So, who is your winner of the craziest costume? Personally, I think Jasmine is the clear winner, Halloween bat costume, reindeer hat and googly eye glasses.. yep, definitely crazy! Once they’d done a spot of dressing up, Thomas got one of the Wipe Clean activity books out and asked for the pen. The other two soon joined in and we all spent some time sitting together writing and drawing. 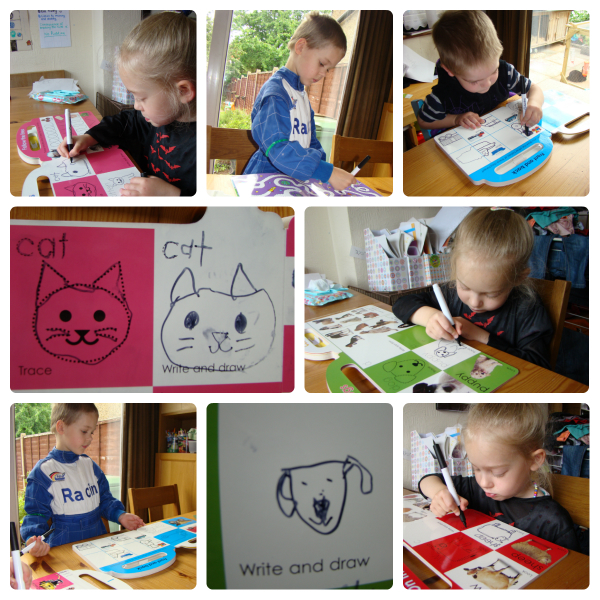 I love these books as they have loads of fun activities for the kids to do and can be used time and time again. The most used books are the Usborne dot-to-dot and mazes books, but we also have a few Priddy books and they all got used today. Ben particularly liked the Priddy Books “Things that go” with all its diggers and cars! He did some really great counting and pattern recognition. After lunch we needed to go into town to do some shopping. I wanted to nip into WHSmiths quickly to get a magazine and while I did get it, we also got these because of course we need more Lego! After dinner this evening the kids built their figures and we read the story from Thomas’ book – Big City Life. The two other important things for me to remember about today are the silkworms shed skin (they are huge now so I’m hoping it won’t be too long until they pupate) and Thomas went in the rabbit run and was really sensible amd stroked both rabbits. Love all the outfits, dressing up is great fun, only wish there were more opportunities for me to do it! It was de-registration day for us today so our we are officially a home schooling family now YAY! So many fun activities in one day!